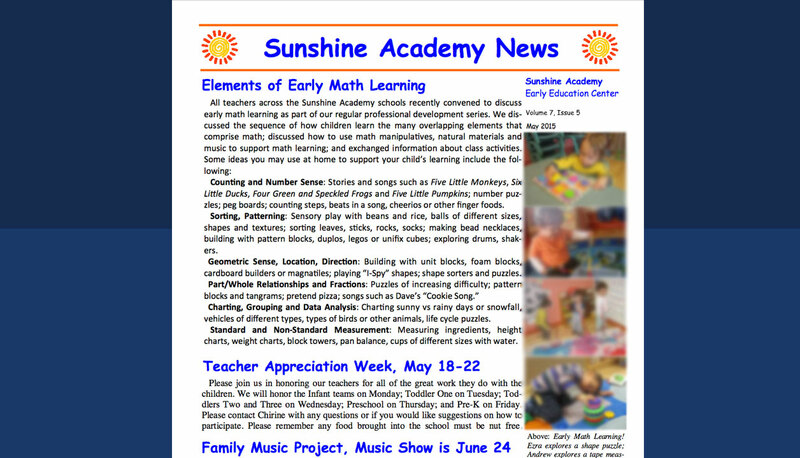 With the start of the new year, we wanted to take a moment to reflect on the potential of the Sunshine community to support each other more effectively and set an example for the children about the positive potential of social relationships. Below is our wish list for the coming year to enable all of us to teach the children through our everyday choices how to be happy, positive, productive and supportive to each other. Celebrate the everyday efforts and accomplishments of all of the children. We all benefit from each other’s talents as a community. Let go of competitive perspectives toward each other. We do not want the children to perceive the world as a zero-sum game where one child’s win is another’s loss. Help each other. Local trust-based relationships are essential for raising children and can be developed within classroom cohorts. Seek out each other for authorized pick-up lists, emergency contacts, weekend playdates and other endeavors. Prioritize face-to-face conversations which allow for real-time sharing of feedback and the give-and-take necessary to work together on common goals. Differentiate big problems from little problems. Email messages that start with “I know this is a small issue” but then go on for 3000 words of increasingly volatile complaint are confusing, time-consuming and ultimately unproductive toward the goal of supporting the children. Share compliments and words of appreciation with each other and the children. Appreciation takes less time than complaint and has more long-lasting influence on relationships and behavior. Let’s make 2018 the best year ever for ourselves and our children!